Trout don’t naturally occur in the Guadalupe, but they seem right at home. There was a narrow path through the woods at the end of a caliche parking lot. I followed it through the brush, and as the trail broke through the thicket and started down toward the river, I could see five or six fishermen already in the water. It was the spring of 1966 and Lone Star Beer had just provided 10,000 rainbow trout to be stocked in the swift currents below Canyon Dam on the Guadalupe River. The Guadalupe is a rare river, arguably the most scenic in the state and resembling a Rocky Mountain trout stream in places. Spring-fed, its headwaters are in the Edwards Plateau, west of Hunt in Kerr County. It meanders its way over limestone beds through the Hill Country and is the most popular recreational river in Texas. Tubers and rafters are abundant during the warm months. The Guad’s also the only stream in the state with water conditions that will support trout year-round. It widens and deepens east of New Braunfels en route to the coast. And it’s rare and special to me, personally. It’s where I caught my first fish, learned to swim and had a few other firsts. A passion for the Guadalupe was formed, and never waned (in spite of nearly drowning in it once or twice). A little boy’s recollections of summertime adventures along the river bank with a cane pole and a can of worms became more epic and precious as the years passed. Before the Corps of Engineers constructed Canyon Dam and created a tailrace of sparkling, rushing water, the river was known for its immense catfish, scrappy goggle-eyes and unique Rio Grande cichlids (not found in many other streams). Family photos show a catfish dangling from a hoe handle held on the shoulders of two tall men, with the fish’s tail touching the ground. Floods on the river were of gargantuan proportions, too. With completion of the dam and impoundment of the previously unharnessed river in 1964, new fisheries developed in Canyon Lake for white bass, striped bass and largemouths. But the most significant fishery would be born below the dam. The owner of Lone Star Brewery in San Antonio had a penchant for trout fishing. Lone Star sponsored a “trout tank” at boat shows and fairs to introduce kids to the sport. At the end of the shows, any trout left over were informally placed in local bodies of water, according to anecdotal reports. I witnessed a rainbow trout being caught on the cold, upper end of Lake Austin in the early 1960s, though Texas Parks and Wildlife Department records show no stockings. Lone Star approached TPWD with the idea of stocking trout below Canyon Dam. Good timing, because TPWD biologists had already begun a study of the effects of the cold water at this location. Their hypothesis was that the cold water coming from the bottom of the deep reservoir would drive many species farther downstream, creating a sport-fishing void upstream near the dam. They were already thinking that stocking trout to fill the newly created aquatic desert might be a distinct possibility. But they needed data to support that notion, as biologists do. Trout are cold-water fish. That’s why they do not occur naturally in Texas’ 100-degree heat and seemingly unending summers. 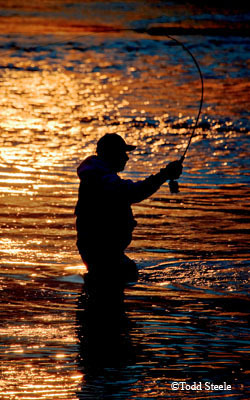 Before the stockings began, Texas trout anglers had to travel north, east or west to ply their sport. Canyon Dam was about to change all that. The depth at the spillway is roughly 124 feet, varying with droughts and floods. With sunlight penetrating no more than 20 feet below the surface, the water coming through the spillway of the dam, deep enough to submerge an upright 12-story building, is frigid. But was it cold enough for trout? That’s what biologists set out to discover. 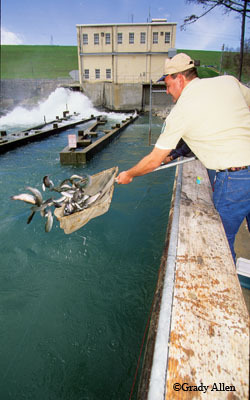 Lone Star donated 10,000 fish and, with TPWD assistance, stocked some decent-sized rainbow trout in the clear, swift-running, oxygen-enhanced water below the dam as it tumbled over rocks and waterfalls. The new fishery was about to be established. The first trout I caught — a 14-inch-long rainbow — tail-danced all the way in, taking my breath as it did. It was spectacular. Another Guadalupe River memory was instantly embedded. I was using light spinning tackle and a black-and-white H&H bent-pin-type spinning lure. That fish must have been hungry! Although there was no limit at the time, I stopped when my stringer held five fish. Two measured 14 inches long; the other three came in at about 11. Sixty-one inches of trout was enough for one day. Besides that, I was cold. Several hundred Texans with little knowledge of trout fishing converged on the river with wide-eyed anticipation of catching a new breed of fish that Friday afternoon in 1966. They came with a Noah’s ark assortment of ill-suited tackle that ranged from closed-face spin-cast rigs to heavy bass tackle. There were even a few “Snoopy” rods. Few had waders that crisp afternoon and fewer knew how cold the Guad could be. The crowd dwindled as legs began turning blue in the icy water that came from the depths of the dam. It was early spring, and as the sun dipped behind the dam, an evening chill set in, running off most of the ill-equipped. I left, too. The next day was Saturday, and more people showed up with a similar array of tackle. A few packed fly rods. With access limited to openings along the river and with a brushy back-cast area, tangled lines were abundant. Artificial flies were far outnumbered by those using spinner baits of every description, or earthworms, canned yellow corn and little balls of Velveeta cheese about the size of the hatchery pellets to which the trout were accustomed. Most of the anglers using artificial lures tossed baits too large to lure a trout. When someone luckily snagged a trout, unbridled riverine chaos broke loose as the unwilling fish torpedoed between legs, lines, lures and submerged limbs, tangling everything in its frantic path. As you might expect, very few anglers had nets. Fish conservation was high as a result; grasping a wriggling rainbow in swift water without a net redefines futility. On a subsequent river jaunt, I met TPWD biologist Bob Bounds, who was conducting creel surveys as part of the research. Bounds, now retired, recently steered me to a 1968 report filed by Richard White, the project leader, whom I also met another day as he was doing creel surveys. The report showed sufficient invertebrate food sources available to sustain trout. Water temperature and dissolved oxygen content were satisfactory. Fishing had increased below the dam 2,000 percent because of the trout fishery, and there was a boost to the local economy. The report recommended that the program be continued. Although the stocking sites are popular, many fly-rodders instead seek a restricted 9.5-mile stretch of the river. That area is defined in the TPWD’s Outdoor Annual as being from the second bridge crossing on River Road in Comal County upstream to the easternmost bridge crossing on FM 306. 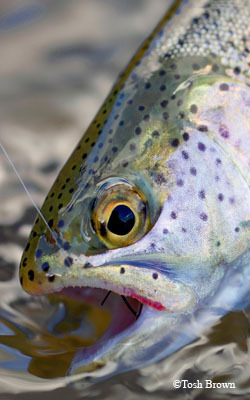 In addition to the trout stocked by TPWD, trophy-sized trout stocked by the Guadalupe River Chapter of Trout Unlimited (GRTU) lurk there and may be kept only if caught on artificial lures or flies. Lures may not contain any fish or animal parts or synthetic scented materials. In the restricted area, the daily bag limit is one rainbow or brown trout that must be at least 18 inches long. Game fish other than trout may be caught and retained in this area by any legal method and within standard bag limits. Access is by water through GRTU leases for its members or other private access sites. Hiring a guide is a wise approach since guides have boats well-suited for the river, know the river and its hazards and instruct their clients on the finer points of Texas trout fishing. Those coming downriver by boat may fish in the restricted area but may not get out on the bank in the leased areas unless they are GRTU lease members. At least one of the GRTU stocking sites (Maricopa Ranch Resort) is outside the restricted area in order to give nonmembers a chance to catch a large trout. The state record brown trout (7.12 pounds, 24 inches) came from the Guadalupe, as did a rainbow over seven pounds that was the state record until last year. Texans have learned that trout are finicky, preferring small insects too insignificant for mature largemouth bass to mess with. Many anglers employ flies that match the hatch, resembling prevalent insects like mayflies, caddisflies and midges. They relegate yellow corn and cheese to tortilla chips and queso après fishing. Out-of-staters have discovered the Guadalupe, too. When winter makes many traditional northern trout holes inaccessible, they know they can still fish in Texas. The Guadalupe River is the southernmost trout stream in the United States and is included in Trout Unlimited’s list of the 100 best trout streams in America. There’s a lot to learn about trout and trout fishing, and it often seems bewildering to a beginner. A free event in February near the river may help unveil some of the mystery, though. It’s an expo of trout fishing lore called TroutFest, and is presented by GRTU with valued assistance from TPWD staff. The stocking of cold-water trout in the Guadalupe not only filled the void caused by the frigid water from Canyon Dam, it also contributed to the rushing, Rocky Mountain character of the river. The trout placed in the river just seem to belong there — rare fish in a rare river. TroutFest is an expo of trout fishing lore featuring national and local guides and experts giving seminars and demonstrating equipment, technique, fly tying and every other aspect of this finesse sport. Headquartered at Rio Raft and Resort on River Road, west of New Braunfels, it’s free on Saturday and Sunday from 9:30 a.m. to 4:30 p.m. TPWD Executive Director Carter Smith will be the featured speaker at the kickoff banquet on Friday night ($50 admission). TPWD fisheries staff members will also participate. Steve Magnelia, district fisheries biologist, will speak on Saturday about the state of the trout fishery on the Guadalupe and some of the research TPWD is conducting on the river. He might even mention a dead trout he recently discovered that had tried to swallow half a hot dog! It must have thought the wienie was the world’s largest hellgrammite, a favorite trout food item.